Cordelia Greythorne is comfortable in her role as governess to the children of Randall Twethewey. Having fled Cornwall following the death of her husband, she has settled into life at Easten Park a truly loves the children under her care. These children had earlier lost their mother, and look to her with love and respect. All of that is upended by the sudden death of Randall Twethewey. Twethewey, in the moments before his death, requests that she and the tutor stay on to care for the care for th Cordelia Greythorne is comfortable in her role as governess to the children of Randall Twethewey. Having fled Cornwall following the death of her husband, she has settled into life at Easten Park a truly loves the children under her care. These children had earlier lost their mother, and look to her with love and respect. All of that is upended by the sudden death of Randall Twethewey. Twethewey, in the moments before his death, requests that she and the tutor stay on to care for the care for the children, at the estate of his brother, Jac Twetheway, in Cornwall. 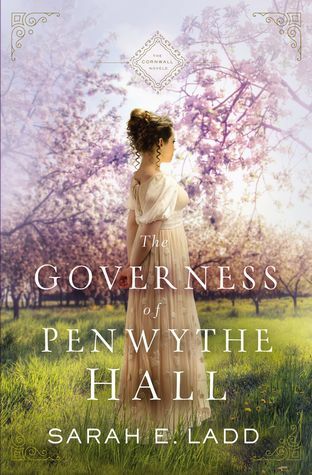 Though she fears the return to Cornwall she stays with the children and they all depart for Penwythe Hall. Jac Twetheway, accused of having stolen Penwythe Hall from Randall, is busy trying to establish the orchards and make the estate profitable again. He does not receive the letter regarding his brothers death, and is quite surprised at the arrival of the tutor, five children, and their mysterious governess. At the Frost Ball rumors swirl about Delia and her background, and the arrival of her brother in law leaves her rattled, yet Jac is sure of her character and trusts her fully even when she evades his questions. This story was rich and captivating. I loved Delia’s devotion to the children, the way that their relationship with Jac slowly grows and flourishes, and the mystery and suspense that builds throughout the story. The book also has rich descriptions of the orchards, garden, crags, and moors that bring the setting to life. This light romance was a joy to read, and the suspense kept turning the pages until late at night. I finished this book the day I started it. Disclaimer: I received a complimentary review copy of this book through the Amazon Vine reviewers program.